A Russian Robot which was programmed to move around independently escaped from its testing lab after an engineer forgot to close a gate. This advanced robot named Promobot is designed uses its artificial intelligence to move around obstacles, escaped its handlers from laboratory on Tuesday and caused a traffic jam on the suburban Russian street. As this news is viral on internet, many believe that this entire act is brought up for publicity. 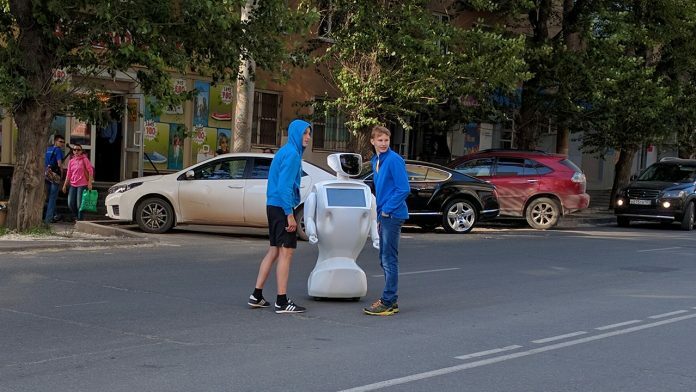 This semi-humanoid Robot has spent a total of 40 minutes of time travelling 50 meters before its battery was dead just as it entered the street. The road patrol service stepped into the sense after thirty minutes of traffic jam. Meanwhile the robot has held the traffic and posed for clicks with passerby. Footage shows that a police officer was standing beside Promobot before a Russian laboratory engineer rushes out to move the escapee back inside. It is ironic that a robot which is designed to tell directions to the people when asked has blocked the road for half an hour. According to Business Insider, Promobot wrote an entire blog post on the incident which claims that escapee’s presentations will start this fall. The post ended with Promobot noting it’s considering an appearance at Tech Crunch Disrupt later this year in September to exhibit its latest robot.